Strictly speaking, Marajó bay is the Pará river estuary, but it is linked in to the mighty Amazon system around the inland side of the massive island of Marajó, the largest freshwater island in the world. The river outflow keeps the waters of the tidal bay, and the Atlantic ocean for some distance out, fresh and salt-free. Marajó bay is some 60km wide at its mouth. Marajó island (which is about the size of the European country of Switzerland, or of the U.S. states of New Hampshire and Connecticut combined), is administratively part of the Brazilian state of Pará which has its capital in the city of Belém, about 25km from the nearest coast of the island across the estuary waters. 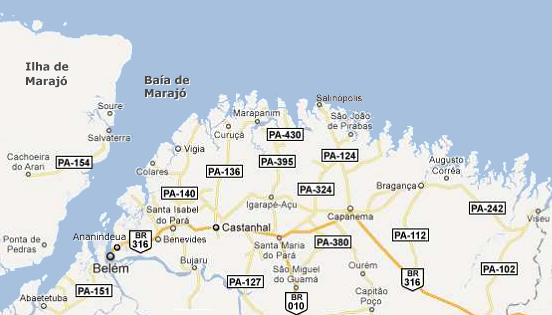 Pará as a whole is nearly twice the size of the U.S. state of Texas, or about the size of France and Spain combined. We will consider just a small corner of it here. The mainland Atlantic coast of Pará state arcs around between Belém in the west (on Guajará bay where the Guama river empties into Marajo bay) and Viseu to the east (on the border with the neighboring state of Maranhão). Viseu is old, but in the early days of the colonial epoch, as today, the most important easterly center of population was Bragança (now somewhat inland of its original position). In the interior lands between these coastal cities is, nowadays, a town and municipal district called Castanhal, 70km from Belém, 140km from Bragança and about 80km south from the Atlantic coast. The region between Belém and Bragança, known as Bragantina, is the most intensively developed region of Pará state. The Portuguese founded Belém in 1616 and Bragança in 1734. Hundreds of years later these were still the only two towns of any size in the whole of what is now Pará state. Any inland colonial* communities that did exist in the 19th century (such as São Miguel do Guama, founded in 1758) were fairly close to Belém and on the banks of large rivers, reachable by (smaller in those days) ocean-going ships from the coast, allowing them to trade their agricultural and forest-extracted products with the outside world. The whole transport infrastructure of the colonial economy of Pará was based on the sea and the natural, seasonal waterways. Away from the colonial population centers, the forest and the smaller rivers were still largely in the hands of the indigenous population. In the 1850s the area between Belém and Bragança was still being described as an “immense emptiness”. This began to change in the late 19th century, however. *Here and elsewhere, the word “colonial” is used in the general sense of referring to the settlers of European heritage, and does not refer to the encouraged foreign immigration into Brazil starting in 1808, which is known as as the “colonial period” in Brazilian history. Belém had been founded as a defensive position against incursions into the Amazon region by other powers, particularly the French. Since its foundation, it had struggled to survive economically, with commerce founded at various times on sugar, cattle, rice, cotton, and coffee. There were also political upheavals. Pará, with Belém as its capital, did not become an integrated state of Brazil until 1775 and there were various uprisings and infightings before some kind of stability was finally reached after a punishing civil war in the 1830s. Thoughts then started turning seriously to taming and colonizing what is still referred to as “the interior” by modern-day inhabitants of Belém. At this time it was possible to travel overland between Belém and Bragança. There were trails created by the indigenous population, some of which had been expanded into cattle runs by hardy colonist cowboys. There were probably small colonial communities along these trails, living alongside indigenous populations at places such as the present site of Castanhal, from quite an early date (one source mentions a community at Castanhal in 1874). The overland route took an enormous amount of time, however, and the only practical way to transport perishable foodstuffs from the farms of Bragança to consumers in Belém was by way of a hazardous ocean voyage around the coast. Despite various attempts, there was very little success in creating more substantial inland colonies and improved infrastructure until the 1880s when three factors combined to drive things forward. The first was a great rise in the demand for rubber (starting in 1879), the product of a tree native to Amazonia. The second, probably not entirely unrelated to the first, was the decision to start building a railroad from Belém to Bragança, long talked about and finally started in 1883. The third, coincidental, factor was the start of a serious drought in the Brazilian state of Ceará in 1877, which drove a large number of work-hardened Brazilians north into Pará in hope of finding work in the expanding rubber industry. Although latex (the natural precursor of rubber) had long been part of the indigenous products exported from the Amazon region, along with castanha (Brazil) nuts, guaraná, cassava, hardwoods such as mahogany, etc., it wasn't until the invention of vulcanization in the mid-19th century that demand for rubber increased greatly. At the time, the Amazon region was the only source of latex and the wealth of Belém increased quickly, as did that of other Amazonian towns. Some, like Manaus, on the Amazon river deep inside the country, were founded on the rubber trade. Perhaps it was this increasing wealth that finally prompted a start in 1883 to the long-dreamed-of project to construct a railroad from Belém to Bragança. From a terminus in São Braz, Belém, the railroad was quickly driven out through the existing settlements of Ananindeua, Marituba, Benevides and Santa Izabel and then onwards to Apeú, which is only a few kilometers short of the current location of Castanhal. But there, in 1885, construction of the railroad stalled. At the time, the central government strategy for development of the interior of the Amazon region was the establishment of “colonial nuclei”, where private companies were contracted to clear lands (probably around the sites of existing small communities for ease of access), install basic infrastructure for housing and farming activities, and transport immigrants from Europe to the prepared sites. This was not always well organized, however, and the immigrants were not always prepared for the conditions that greeted them. This was the case for the planned colonial nucleus at Apeú, where the immigrants refused to disembark the train that took them there in 1886. So the planned colonial nucleus of Apeú failed. 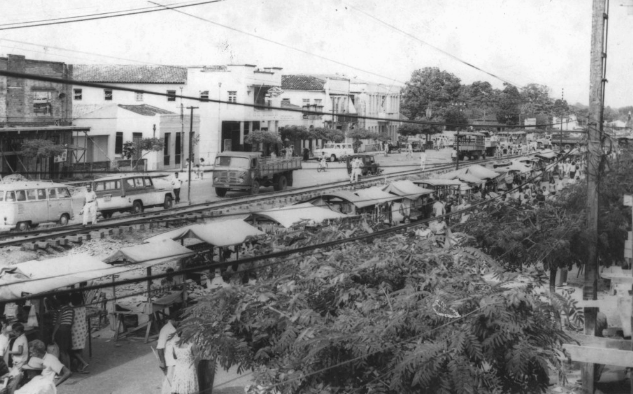 The presence of a railroad station (which was the terminus for several years) eventually enabled the population center at Apeú to grow. But, for whatever reasons, Apeú remains to this day a small (though pleasant) village while its close neighbor Castanhal prospered into a large city, despite having no apparent physical advantages and not getting the railroad until several years later in 1893. But apart from the initial failure of immigration to the colony, an outbreak of yellow fever in Apeú shortly afterward may have been a factor in shifting the focus to Castanhal. While the planned colony of Apeú was founded on national government policies, Castanhal seems to have been a more locally rooted project, founded by people who were more sensitive to and aware of the local conditions and requirements. 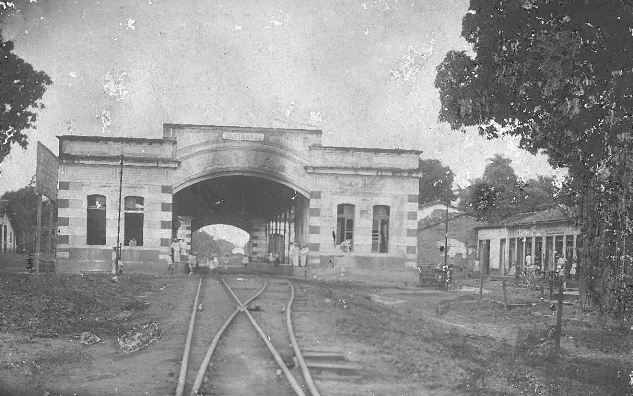 Castanhal was named as an official colonial nucleus in 1889, three years after the colony of Apeú failed, and four years before the railroad arrived in Castanhal (though the additional journey time from the railroad terminus in Apeú by road would have been only an hour or so by horse-drawn transport). Although it became an officially supported colony, there seems to have been no attempt to force the population of Castanhal with “raw” immigrants as in Apeú and elsewhere. Both Apeú and Castanhal are named for the small rivers on which they sit. The names of the rivers seem to have been taken from the maps of early (pre-Belém) French explorers, Apeú being of indigenous origin and the Castanhal named for the the castanha (Brazil nut) trees lining its banks. In 1891, just two years after it got colony status, an inspection of the Castanhal site reported seeing 46 family houses, an infirmary house, a large administration house, a telegraph house, 6 barns, and 10 agricultural plots each measuring 440x110 meters. Upon the arrival of the railroad in Castanhal two years later in 1893, the colony was being proudly shown off to visiting dignitaries from Belém. 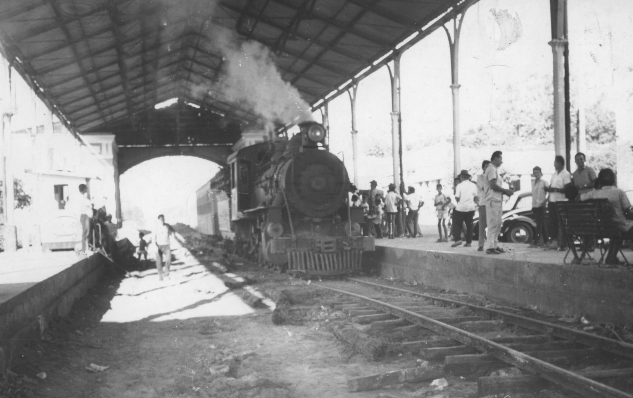 It is perhaps a significant indicator of the growing importance of Castanhal that construction of the railroad, halted for 8 years, was resumed just for the short stretch between Apeú and Castanhal. Construction then halted again for another 10 years or so. Finally, we return to our third factor in the increased colonization of the interior of Pará, and find another possible explanation for the success of Castanhal compared with the relative failure of Apeú. Castanhal was founded mainly by hardened, enterprising and ambitious Brazilian migrants from Ceará. It is estimated that some 250,000 cearenses migrated to the Amazon region in this period, up to 1900. Some 300 of them, it is said, settled in Castanhal and were responsible for its early success. It is plain to see from the quality and size of the earliest buildings shown in the photos here that there was nothing “makeshift” about the establishment of this town. In 1899, both Apeú and Castanhal were officially elevated from “colony” to “village”, although quite what that means in terms of administration and benefits to the communities isn't clear. 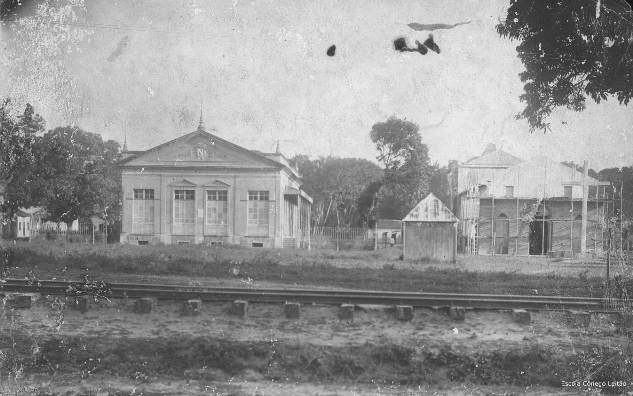 In the first decade of the new century (exact dates are hard to pin down, varying between sources), Castanhal acquired a fine railroad station (on the intersection of Avenida Barão do Rio Branco with Rua Irmã Adelaide) and the line was finally extended to its intended final destination of Bragança. Now the growing center of Castahal could more easily extend its influence and market eastwards. Between Castanhal and Capanema (another, smaller, town created by the railroad and cearenses) the railroad took a more northerly route than the present BR-316 road, taking in Igarapé-Açu along the way. Castanhal does not seem to have been directly involved in the rubber trade, which was focused in the more westerly regions, but the additional wealth it brought to Belém assisted in the accelerated colonization of Bragantina which brought about the creation of Castanhal. 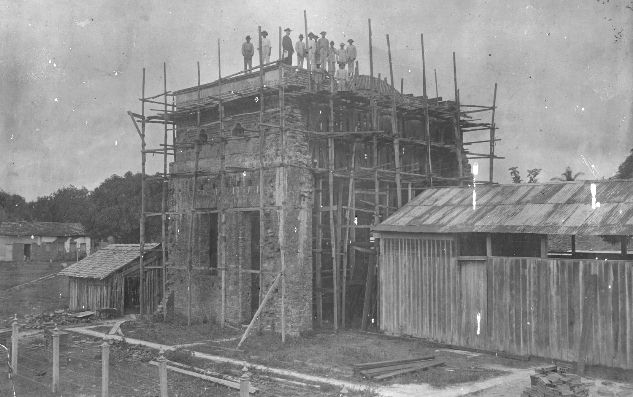 The “rubber boom” came to an end around 1912 when cheaper and more convenient supplies from Malaysia became available. There was a brief resurgence during the second world war due to the Japanese occupation of Malaysia, but afterward the increasing use of synthetic rubber decimated the whole natural latex industry. But the improved infrastructure had already built momentum in the agricultural exploitation of the land between Belém and Bragança, allowing further infrastructure improvements, and opening new opportunities for Castanhal in servicing agricultural developments throughout the whole region. 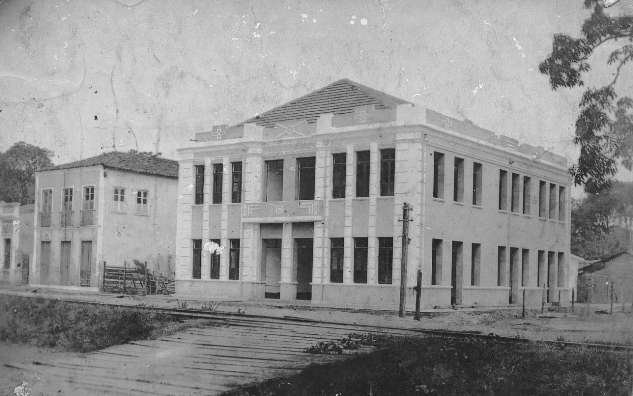 In 1932, Castanhal became a municipal district independent of Belém and incorporating Apeú. This is now celebrated as Castanhal's official birthday with a holiday on January 28th each year. 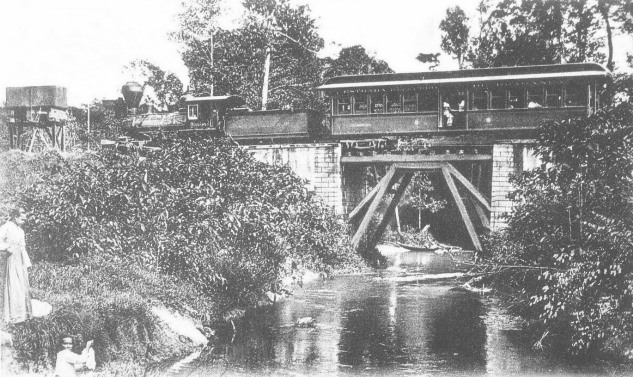 Ownership of the railroad passed from the state of Para to the federal government in 1922 and in 1957 it was incorporated into the newly established national rail network. Through the 20th century the railroad was steadily expanded with extensions and branch lines. But in 1964 it was suddenly closed down. The closure was probably due to the sort of skewed economics that made rubber wheels appear preferable to steel wheels, being cheaper for passengers and freight due to artificially low gasoline prices and more lucrative for government revenues, and which caused so much vandalism to public transport services throughout the whole world in the 1960s and beyond. But at least one account puts the closure of the railroad down to government spite! There was always tension between the tough northerners and the central government and the suddenness of the decision (the extension to Belém docks was completed only in 1960) and the order to destroy all traces of the railroad as soon as possible lends some credence to this view. But it probably would have happened sooner or later anyway, such was the trend of the times. Stations were demolished (Castanhal's in 1966) and the rails taken up. Today, a typical wood-burning steam locomotive which served on the line (one of 32 which were working at the end) is preserved as a static exhibit in one of Castanhal's town squares. The central São Braz station in Belém survived total demolition by being converted into a bus terminus. The 1960s and 1970s saw increased development of the road system, but the roads weren't always ready to take the full load previously carried by the railroad, especially for the locales served by the branch lines, causing a short-term transport crisis in the region. One of the earliest asphalt-paved roadways outside of Belem was that to Castanhal. 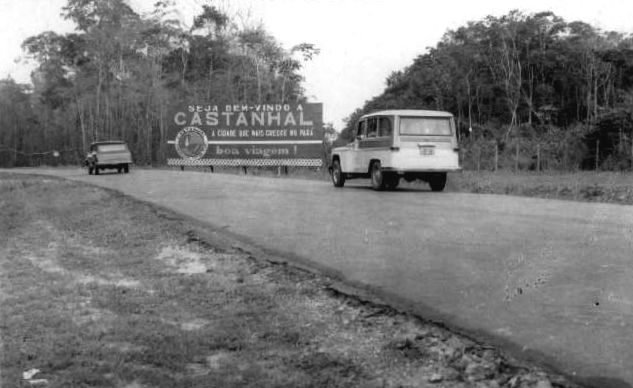 This road became the interstate BR-316, passing close to Apeú before going on through Castanhal to Santa Maria, where it joined with the BR-010 to Brasilia, and then through Capanema. But then it bypassed Bragança as it descended into the north-eastern states, leaving that old city somewhat isolated from the mainstream. Around the turn of the 21st century, the full distance of the BR-316 between Castanhal and Belém became a dual-carriageway, 4-lane highway. In Pará, just because a road is inaugurated and named doesn't always mean that the road is paved, and dual carriageway is still the exception rather than the rule. But asphalt, even asphalt resurfacing (rather than just patching the potholes) is becoming more frequent and of better quality, and where resurfacing has to wait, the potholes are patched more efficiently than they once were. The road is good enough so that the journey time between Belém and Castanhal is about an hour. For many years, the BR-316 was the only land route into and out of Belém and all traffic passed through Castanhal. This has changed in recent years with the opening of the “Alça Viária”, opened in 2002, which has diverted some of the traffic to and from the south of the state. The Alça Viária incorporates three major river crossings, the largest of which is the almost 2km long suspension bridge across the Guamá river. Unfortunately, despite the huge sums of money spent on the bridges, the roadway itself was cheaply constructed and it has needed continuous maintenance just to keep it passable. A major program of reconstruction is now underway and the lessons learnt on the Alça Viária are very possibly responsible for the improved quality of roadway construction and repair observed in the area since. Today, the city of Castanhal abuts Apeú, threatening to swallow it as a mere neighborhood. But it is still known as “Apeú village” and it still has its own distinct character that appears older somehow, known for its woodworking artisans. Apeú is not directly on the route of the BR-316 which adds to to its tranquility. Most of the present-day expansion of Castanhal is on the other side of the city, so maybe it will keep its character. But it wouldn't be surprising if Apeú acquired more popularity as a commuter base, combining a pleasant “off the beaten track” environment with easy access to work in Belém and closeness to the health, education and shopping facilities of Castanhal. 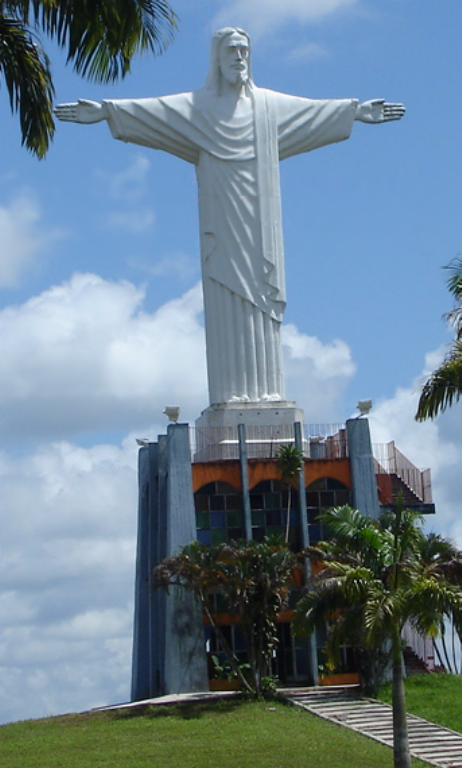 The primary modern-day visual symbol of Castanhal is, like Rio de Janeiro, a statue of Christ the Redeemer (Cristo Redentor). Unlike Rio de Janeiro, however, Castanhal has no Corcovado mountain and its statue is 12 meters, not 30 meters, tall. To compensate a little though, Castahal's pedestal is taller at 12 meters, against Rio's 9.5 meters. Erected in 1982 in commemoration of 50 years as a municipality, the statue was pre-moulded in Campinas and transported to Castanhal in 186 pieces. The Roman Catholic Diocese of Castanhal was established in 2004 and now Castanhal has a large cathedral (Catedral de Santa Maria Mãe de Deus), with seating for 2,400 people, near the statue of Christ the Redeemer. The cathedral was dedicated in 2011 after nearly 10 years of construction. Castanhal's catch-phrase is “Cidade Modelo” (“Model City”). 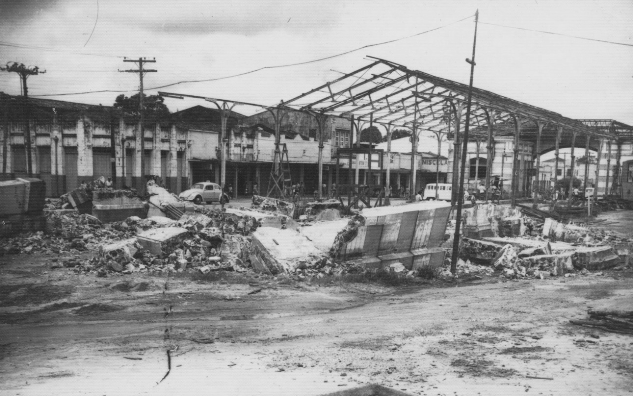 Rather than meaning that the layout of the city was rigorously planned right from the start (like the paraense city of Paragominas), it seems to mean that the municipal government has taken rather more control than is normal in this region of its continued development (unlike Paragominas). It really does seem that Castanhal has benefited throughout its existence from better than average and well-funded local government. The politicians take an obvious pride in the amenities and appearance of the urban area. Perhaps because of the lucky chance that the early transport system was based on the railroad, the main shopping street of Castanhal did not grow up along what is now the main through road. In 1948, the population of the municipal district of Castanhal was recorded as 14,261, a fair size for the day. The present (2011) population of the municipality is about 175,000 (larger than present-day Bragança) so it has grown consistently and rapidly. The main economic activity is characterized as “commerce”, principally in supplying the large surrounding agricultural region with goods and services, as always. But in the 1960s and 1970s, having reached a “critical mass” of population, Castanhal also started attracting manufacturing industry, originally mostly rooted in agriculture, such as food and jute products (the jute products factory, making sacks, etc., directly employs some 1,500 people). There is today an ongoing effort to attract more general manufacturing to the city, with the creation of a large industrial area to the east of the city.